“Rescue Me” is a recurring column by Samantha Randall, editor-in-chief at Top Dog Tips. She’ll provide personal anecdotes and perspective about her life as a pet lover with a passion for cat and dog rescue. Today, she talks about retraining a rescue that may have picked up bad habits. 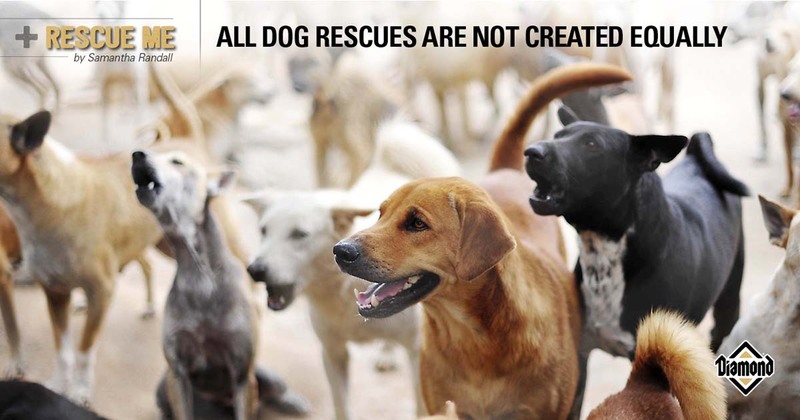 All dog rescue centers are not created equally. Some are for fosters only and some have very distinct criteria for adoption. When looking for a new furry family member, you want to get it right and do your legwork. It’s hard to take your time when you see so many animals in need, but you need to make sure that the organization you’re adopting from will provide what you need, from information to support. The best thing for you and your future dog is to take the necessary steps to ensure that this is going to be the right fit. That begins with finding a legitimate animal rescue organization. When searching for the right rescue organization, first ask these questions. Then, take a look at this list for help in finding the right shelter for you and your next canine companion. What type of dog are you looking for? Many rescue centers cater to only one breed of canine. They may also take mixed breeds if the dominate breed is still the breed they specialize in. For example, a Labrador rescue may accept dogs that are only 50 percent Lab. Some breeds are more active than others, or easier to train than others. There is nothing wrong with finding the best breed for your situation, and then searching for a rescue that specializes in that breed. Don’t forget that many rescues accept all breeds, so if proximity is important, there’s nothing wrong with trying those closest to you first. Don’t be afraid to branch out if your local rescue shelter doesn’t have what you are looking for. Getting the best pet for you is worth a little travel time. You can Google, or, once again, check the above linked list for shelters that specialize in the breed you are most interested in. Do you have time to train your new dog? If the answer to this question is no, then you may want to find an organization who places all its rescued dogs into foster homes before adoption. These pups are already in a family environment. Animals in foster homes are often already housebroken, and many will also know basic obedience commands and house manners. This knowledge makes them great for busy people and weak trainers. Please remember that when your new fur-baby comes home, he or she may temporarily forget what they have learned. Be patient. Your new dog will be nervous and shy. They will need time to get comfortable and fall back into a routine. Don’t fuss and holler when they mess up. It will only cause anxiety and make the behavior worse. Is it important to know a lot about your potential pet? Some people don’t have a lot of time to commit to training a dog or finding out a lot about its personality. They need a canine that they are pretty sure will quickly fit with their home. If this is you, don’t feel guilty! You want to go with either a furry friend that has been in a foster home or a rescue center that is smaller in size. These organizations will know more about each animal’s individual personalities. If you want the most information possible, go with an older dog that has been with the rescue for some time. Are you willing to give personal information and meet certain requirements? Most rescue centers will require basic information and references. Some require very detailed information that potential pet parents are not comfortable giving. Some places will even do a check of your home. Most rescue centers have their questionnaire and required information posted on their website. Look it over before you make the call or the trip. If you are uncomfortable with the things you find there, you should look for another place. You can usually tell what answer they are looking for, and they usually won’t change their mind. If you don’t meet the requirements, keep looking. If you don’t meet the requirements for the breed you’ve always dreamed of, you may need to adjust your dreams. One example is that some dog breeds, like Huskies, can jump and climb, making them master escape artists. They need a yard with a six-foot fence. If you don’t have this requirement, then you shouldn’t adopt this kind of dog. If you don’t want to make the changes needed, it may be best to pick another breed. Did you do your research? Family pets are a money-making industry. The business of rescuing dogs is sometimes no different. You want to make sure you are giving your money to a reputable organization. Money keeps places in business. Don’t give your money to someone who shouldn’t be open. All rescue facilities will charge an adoption fee. This helps them cover expenses like food, shelter, vet care, electricity, water, and other expenses. Check around and see the prices of other rescues near the one you are interested in – if the one you’ve chosen is significantly more expensive, then they may be out for a profit. If they are a lot cheaper, then they may not be providing the services they should be giving their animals. Do your diligence; read online reviews, etc. If you find a shelter that is providing substandard care, you may be tempted to rescue animals from the rescue center. Just remember, money keeps these places going. The best thing to do is report the shelter to the local ASPCA and the city or county/parish authorities. Also, always check for a 501(c)3 certificate. This proves the shelter has registered as a nonprofit and must comply with certain rules and regulations. A dog is a long-term commitment. Nothing is more heartbreaking for you and the fur-baby than having to bring your dog back to the organization you got it from. I know; I’ve been there. Take time to sit down and think of your “must-haves.” Have everyone in the family participate. Then use those guidelines and these questions to help you find the perfect rescue dog for you. Stick to your guns! It is hard to pass up canines in need, but remember, it is better for everyone involved if you are patient and wait for that perfect match.